For over 30 years, Bill Purdy has focused his practice on construction claims and disputes and on federal procurement law. He is the first of only two Mississippi lawyers ever invited to be a Fellow in the select American College of Construction Lawyers, which includes only the most skilled and accomplished construction lawyers in the United States and abroad. 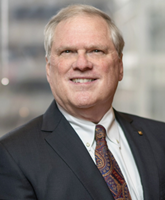 Bill is among only a handful of lawyers in the country to be both an ACCL Fellow and also to be elected by his peers as a Fellow in the American College of Trial Lawyers, which is limited to the top one percent of the best courtroom lawyers in the country. He is one of only two Mississippi lawyers with a “Band 1” (highest) rating in construction litigation by Chambers USA, the authoritative legal guide, which referred to Mr. Purdy as the “dean of the state’s construction lawyers”. Mr. Purdy is a Master of the Bench (highest rating) of the central Mississippi chapter of the American Inns of Court and is a Fellow of the Mississippi Bar Foundation. Bill was honored by a unanimous Joint Resolution of the Mississippi House and Senate as an “Outstanding Mississippian”. He has been consistently rated byMidSouth Super Lawyers as one of the “Top 50” Mississippi lawyers, without regard to practice specialty. Bill is licensed to practice in all courts in Mississippi and in all federal courts, boards, and tribunals which decide federal government claims, contract disputes, and bid protests. Before law school, Mr. Purdy served with the Marines in Vietnam as an infantry company commander. He was awarded the Bronze Star for valor in combat, the Purple Heart medal, and the Vietnamese Cross of Gallantry. University of North Carolina - Chapel Hill, A.B.